The world’s largest Floating, Production, Storage and Offloading (FPSO) vessel left the Samsung Heavy Industries shipyard in Geoje, South Korea under tow on Tuesday for its voyage to Nigeria. The vessel, with a maximum displacement of 499,900 tons, will be moored at the Egina oil field some 200 km off the coast of Nigeria and has a storage capacity of 2.3 million barrels. The massive facility measures in at 330 meters long by 61 meters in breadth and 34 meters tall. The facility’s topsides alone weigh in at about 60,000 tons. With a hull weight of 90,000 tons, the Egina FPSO in the range of 150,000 tons lightweight. The offshore oil field is one of the flagship ultra-deepwater projects in Total’s portfolio. The field consists of a total of 44 subsea wells that will be connected to the FPSO using umbilicals and risers. Tuesday’s departure of the gigantic floater marks the latest of three offshore mega-projects completed by SHI this year. In April, SHI delivered the Ichthy’s CPF, the world’s largest floating gas processing facility. The delivery was followed by the sail-away of the Prelude FLNG, touted as the largest offshore structure ever constructed, this past June. SHI says Egina’s voyage to Nigeria will take about 3 months. 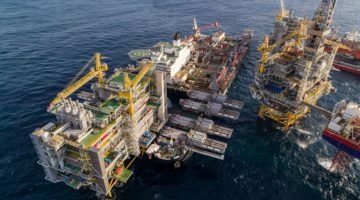 From there, the installation of the remaining topside modules and commissioning will be carried out by a local partner of SHI, with delivery scheduled for the second half of 2018.